"Awarded to an elite group of web sites for their quality of presentation, content and accuracy." Dr. Milan Jira from Popper's visit to Prague, May 1994. A video introduction to my book: The Myth of the Closed Mind. 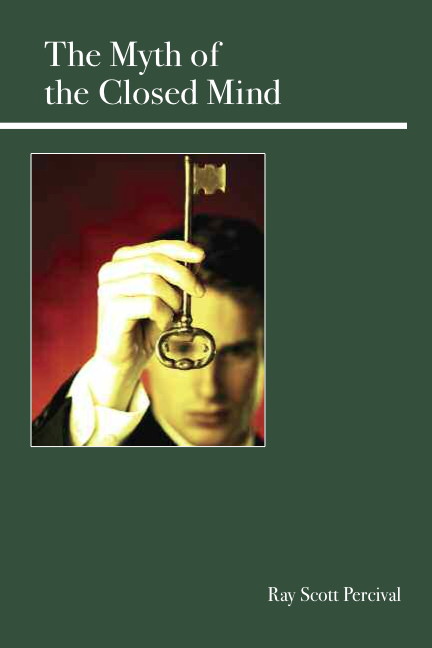 My book is a major strategic argument against the idea of the closed mind. It is a contribution to Karl Popper's critical rationalism. The closed mind thesis is the idea that some people and ideas are irrational and insulated from criticism. Religious zeal, suicide terrorism, passionate commitment to ideologies, and various psychological tests are often cited to show that humans are fundamentally irrational. I argue that even the most menacing ideological juggernauts such as Communism, National Socialism and various Fundam entalisms can be undermined by sound argument. Rationality does not mean the absence of error, but the possibility of correcting error in the light of criticism. In this sense, all human beliefs are rational: they are all vulnerable to being abandoned when shown to be faulty. The book is Published by Open Court Publishers, Chicago and available from many outlets, including the U.S. and U.K. Amazon sites. 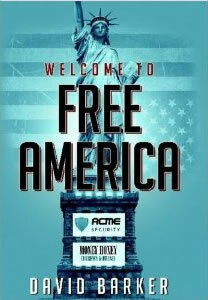 Voting Available until 28th February 2013. "At last, a philosopher in the 21st century willing to stand up and argue for the power of sheer human rationality. Because Ray Percival is so convinced, correctly, of the impact of a rational argument on the human intellect, he is unafraid to offer a no holds barred, comprehensive brief on the strength of rationality in this book. Preferring Kant to cant, surveying history and reason from Socrates to today's age of terrorism, Percival has written a tract that Milton, Jefferson, Mill, and Karl Popper would be proud of. The next time I get into an argument with a well-meaning person who wishes to censor a propagandistic, corporate, or individually hateful point of view, I will recommend a reading of Percival's The Myth of the Closed Mind." -Paul Levinson, Professor of Communication and Media Studies (Fordham University) and author of New New Media. Also available as a Kindle eBook and as an Ibook at the U.S.A. Apple Store. Panel interview by Dan Schneider for Cosmoetica, 2nd July 2017. Promote, explore and defend the heroic and critical ethos of science through philosophical debate. Promote the sense of wonder that forms the motivation for science and philosophy. 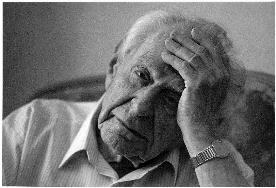 Critically explore and apply the work of Sir Karl Popper, a key figure in the defence of science. Make this accessible to new audiences and participants: beginners to science and philosophy, the newly opened societies of Russia, Eastern and Central Europe, less developed countries, the young and the disabled. In 1934 Popper published what many regard as his Magnum Opus The Logic of Scientific Discovery. The famous chemist Wachtershauser said that this is a "gem" and that it liberated him from a sterile accounting view of science. Wachtershauser subsequently went on to develop one of the main theories of the origin of life. Frank Tipler, the famous cosmologist, regards this as the most important book of the 20th century. In one majestic and systematic attack, psychologism, naturalism, inductionism, and logical positivism are swept away and replaced by a set of methodological rules called Falsificationism. Falsificationism is the idea that science advances by unjustified, exaggerated guesses followed by unstinting criticism. Only hypotheses capable of clashing with observation reports are allowed to count as scientific. "Gold is soluble in hydrochloric acid" is scientific (though false); "Some homeopathic medicine does work" is, taken on its own, unscientific (though possibly true). The first is scientific because we can eliminate it if it is false; the second is unscientific because even if it were false we could not get rid of it by confronting it with an observation report that contradicted it. Unfalsifiable theories are like the computer programs with no uninstall option that just clog up the computer's precious storage space. Falsifiable theories, on the other hand, enhance our control over error while expanding the richness of what we can say about the world. Any "positive support" for theories is both unobtainable and superfluous; all we can and need do is create theories and eliminate error - and even this is hypothetical, though often successful. Many superficial commentaries are keen to point out that other people stressed the importance of seeking refutations before Popper. They overlook the fact that Popper was the first to argue that this is sufficient. This idea of conjecture and refutation is elaborated with an orchestration suggestive of someone who loves great music. (Popper loved Mozart and Bach, and took great pleasure in composing his own music.) The common idea that Popper neglected to consider whether Falsificationism itself is falsifiable is already scotched here. You can falsify a description, but not a rule of method as such (though obviously a rule can be criticized in other ways). The notion that science offers proof is now only advanced by popular treatments of science on TV and in (many) newspapers - most journalists (with a few important exceptions) are sadly completely devoid of theoretical knowledge: a side-effect of overspecializing on the immediate moment. But then, anyone can improve! Most people who think they have a ready rebuff to Popper's position have never read his work. If they only read the original works, in most cases they would see that their supposed "Point that Popper neglected" had already been considered and exploded. A good example of this is Lewis Wolpert's remarks on Popper's works in his otherwise excellent book The Unnatural Nature of Science. He seems to think that Popper's falsifiability criterion ignores hypotheses about probabilities - overlooking the blatant fact that The Logic of Scientific Discovery devotes more than a third of its pages to the two fundamental problems of probability in an effort to find a solution that will also allow hypotheses about the probability of events to be capable of clashing with the evidence! Popper was in fact fascinated by probability and even produced his own axiomatisation of the probability calculus. For the best current re-statement, defence and - more importantly - application of Falsificationism see David Miller's Critical Rationalism: A Re-Statement and Defence..(for amazon.com) (for amazon.uk) Miller was a very close friend and colleague of Popper's. He pulls no punches and is (despite his modesty) Popper's best knight. If you want razor-sharp logical accuracy, a full arsenal of arguments, and comprehensive demolition (with unrestrained collateral damage) of the opposition, Miller's book is the answer. It is important for students because it carefully delineates the various relevant intellectual combatants. And will interest scientists because of its treatment of chaos and propensities. Feel free to join our discussion group,Critical Cafe, and visit the Book Shop for my abstracts on Popper's books. In our forums we have the pleasure of the company of both critics and adherents of Popper's work. This makes for lively and productive exchanges. Join us in our intellectual quest. For at least a year now this book has been my constant companion. Every one of the essays bears reading again and again. If you want the purest crystalline critical rationalism, this is the book you must read. The last vestiges of justificationism are gone. What is left is a thing of beauty and rare insight. I'm not going to try to summarize any of the essays because anything I could say would just be a pale reflection. What I will say is that Miller's formulations are strikingly original, really unlike any of Popper's other students. And the logical rigor is there in some ways even more than with Popper. Lester's book is a fascinating application of Karl Popper's method of critical rationalism to the elaboration and defense of a conjectural utopia. 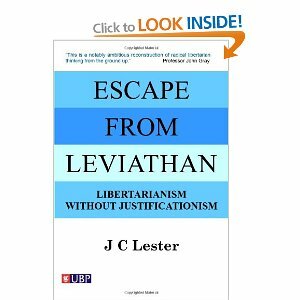 Lester's book makes anarchy a more appealing type of society by dealing with a central concern of many intellectuals: reconciling the apparently incompatible goals of liberty, welfare and the absence of government. This edition is only £14.24. At that price and with such critical acclaim, any library on liberty without it would be shamefully incomplete. I'm putting in an order right now. This book probably represents a landmark in the literature of liberalism on two counts. One of these is the robust statement of his major thesis on the compatibility of free markets, liberty and welfare. The other is the way he uses the non-authoritarian theory of rationality expounded by Karl Popper and William W Bartley. Rafe Champion. David Barker invites us to join him in a captivating thought experiment about a possible future without the united states government. Starting with a clear history and diagnosis of the grave and incorrigible economic crisis that haunts the u.s. government - a colossal and unstoppable debt produced by the contradictory demands of voters for lower taxes and more government spending - David Barker predicts the collapse of government and its replacement by a thriving society based on rules without rulers. Driven by the unpopularity of higher taxes and cut backs in government spending, competing political parties learn to take refuge in the less visible tactics of printing money and increasing government borrowing. But the unintended affect of this is an eventual inability of the government to pay its bills, at which point the u.s. government collapses along with the authority of government. Drawing on his specialization in economics, David Barker suggests ingenious and plausible ways in which social problems in a society without government can be solved while respecting justice and liberty. Of course, as Karl Popper argued, because of the influence of new knowledge in the future, there is no inevitability in the movement of society and we cannot give strictly a "scientific" prediction of a detailed future. But we can make educated guesses about it and even about our personal utopia (in the sense of ideal society). It could work, but even if it wouldn't work with those particular arrangements, Barker's hypothetical future can help us to view our current state of affairs more clearly. After all, we only have governments and collusions between governments and business as examples. We don't have true purely private property markets - yet. David Deutsch is an admirer of Karl Popper's work and he applies Popper's and a host of his own keen insights with a clarity worthy of Bertrand Russell. One of my pet delights of the book is that drawing on his reflections as a pioneer of science (David was the inventor of the concept of the quantum computer), David squashes the silly but popular notion that science is about the prediction of experiences. Except for pyschology, of course, scientific theories actually do not talk about experiences as such, but rather about the underlying universal structures of the world. 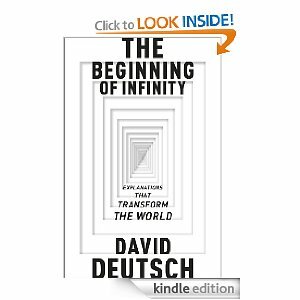 In contrast to the mass media's cacophony of doomsday prophecies, Deutsch's The Beginning of Infinity espouses a refreshingly optimistic view of humanity's potential for everlasting progress in the growth of knowledge, morality and the extension of our increasingly richer lives. Finally available in English, it is a major contribution to the philosophy of science, epistemology and twentieth century philosophy generally. The two fundamental problems of knowledge that lie at the centre of the book are the problem of induction, that although we are able to observe only a limited number of particular events, science nevertheless advances unrestricted universal statements; and the problem of demarcation, which asks for a separating line between empirical science and non-science. Popper seeks to solve these two basic problems with his celebrated theory of falsifiability, arguing that the inferences made in science are not inductive but deductive; science does not start with observations and proceed to generalise them but with problems, which it attacks with bold conjectures. The Two Fundamental Problems of the Theory of Knowledge is essential reading for anyone interested in Karl Popper, in the history and philosophy of science, and in the methods and theories of science itself. After The Open Society: Selected Social and Political Writings. In this long-awaited volume, Jeremy Shearmur and Piers Norris Turner bring to light Popper's most important unpublished and uncollected writings from the time of The Open Society until his death in 1994. After The Open Society: Selected Social and Political Writings reveals the development of Popper's political and philosophical thought during and after the Second World War, from his early socialism through to the radical humanitarianism of The Open Society. The papers in this collection, many of which are available here for the first time, demonstrate the clarity and pertinence of Popper's thinking on such topics as religion, history, Plato and Aristotle, while revealing a lifetime of unwavering political commitment. After The Open Society illuminates the thought of one of the twentieth century's greatest philosophers and is essential reading for anyone interested in the recent course of philosophy, politics, history and society. The Karl Popper Web is an online complement to the Annual Conference on the Philosophy of Sir Karl Popper. I announced my intention to set up such a service at the 1995 Conference held at the LSE on 11th March. At the Conference I was approached by Barry McMullin, of the School of Electronic Engineering of Dublin City University, who offered his help to put together an electronic forum on the Internet. Apart from perhaps Bertrand Russell, Popper is unique in having had such a wide influence outside of traditional academia. Many people, not just philosophers, have been intrigued, inspired or annoyed by Popper's ideas. His ideas have relevance and impact in science, business, politics, art, music, and also in peoples' personal lives. We expect and encourage both professional and non-professional philosophers to participate in or visit The Karl Popper Web. Professionals and non-professionals can learn from one another. The good habits of the professional (diligence, focus etc.) can rub off and the professional is saved from the obscurity and elitism of overspecializing by having to be clear to the non-professional. The great philosophy and science writers (Darwin, Russell, Popper, Einstein, Dawkins, Deutsch) are all characterized by their keenness to communicate to all intelligent people, not simply to their co-specialists. TKPW is a globally accessible space for the meeting of minds from different backgrounds and specialisms with a common sense of wonder in life and the world. Many projects intended to promote a better understanding of science are very clever but also in way superficial. They portray the effects of scientific laws - the fireworks of science - very well, but alone they cannot convey and inspire the method and the self-critical ethos of science. I am in favor of firework displays, and the laws of science need well-designed and innovative illustration. As Lewis Wolpert's book argues superbly, science is not technology. It is not computers, Saturn V rockets, fission or fusion reactors, nor any of the exciting and fascinating products of an advanced industrial society that enable us to control the world. It is rather a desire to understand the world. This is Wolpert's common ground with Popper. I wish to emphasise the philosophical aspects of science, which spring from a wonder at the existence, structure and evolution of the world. The names KARL POPPER FORUMS, The Karl Popper Web, TKPW, The Critical Rationalist and The Critical Café, the arrangement of services comprising The Karl Popper Web, and this introductory text for The Karl Popper Web are all ©1995-98 by Dr. Ray Scott Percival . All rights reserved. Every reasonable effort is made to ensure the reliability and continuity of The Karl Popper Web. However, the provision of the facility is subject to the condition that neither the editors, nor the sponsors, nor any of their employees or agents will be held liable for damages, including any general, special, incidental or consequential damages arising out of the use or inability to use the facility (including but not limited to loss of data or data being rendered inaccurate or losses sustained by you or third parties or a failure of the facility to operate in any particular manner).